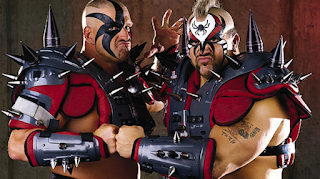 The Road Warriors are, arguably, the most intimidating tag team in the history of the wrestling business. 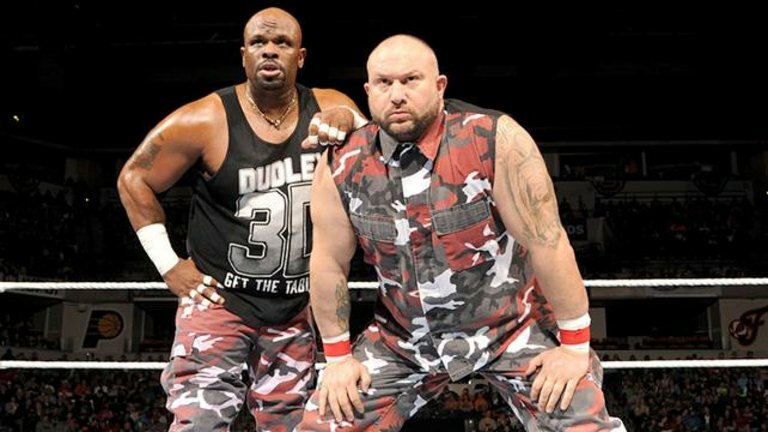 The Dudley Boyz are one of the most decorated tag teams in the history of the business. And while both teams' careers overlapped, there was never a meeting while both teams were at the top of their game. Michael Hegstrand, aka Road Warrior Hawk, passed away in 2003, effectively ending any opportunity for the two teams to meet. That being said, as the case with any dream match, the ideal meet up would have been mid-80s Warriors versus early 2000s Dudleys, while both teams were in their prime. 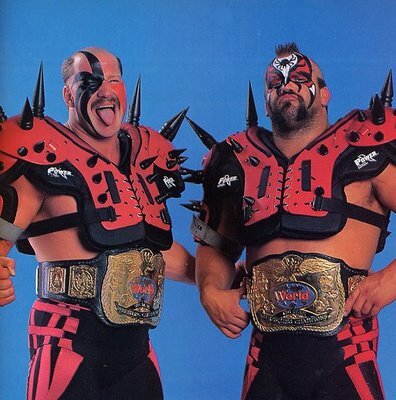 The Legion of Doom was a faction created by Paul Ellering in 1983. The Road Warriors were the centerpiece surrounded by eventual wrestling legends, including Jake Roberts, Arn Anderson and the Iron Sheik amongst others. Hawk and Animal took the tag team scene by storm, winning their first title within six months of their debut. The team's unique look (post-biker gimmick), with Animal's regular mohawk and Hawk's reverse mohawk, along with facepaint and massive builds, made them stick out like a sore thumb in Georgia Championship Wrestling. While there were initally questions if the Road Warriors style would survive in the business, Hawk and Animal perservered and reached legendary status in just a few years. 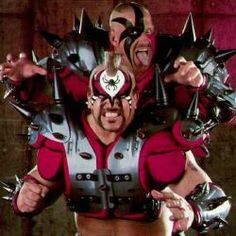 The one thing that's always stuck in my head about the Road Warriors was the fact that they looked like a WWE act performing in areas where "wrestling" was at a premium. Nikita Koloff also fits that mold, in my opinion. 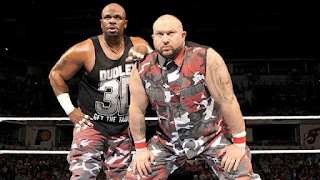 The Dudley Boyz were key players in the growth and success of Paul Heyman's ECW. While their run with the company spanned only three years, it feels like they were there for decades (yes, I know ECW didn't exist for decades). 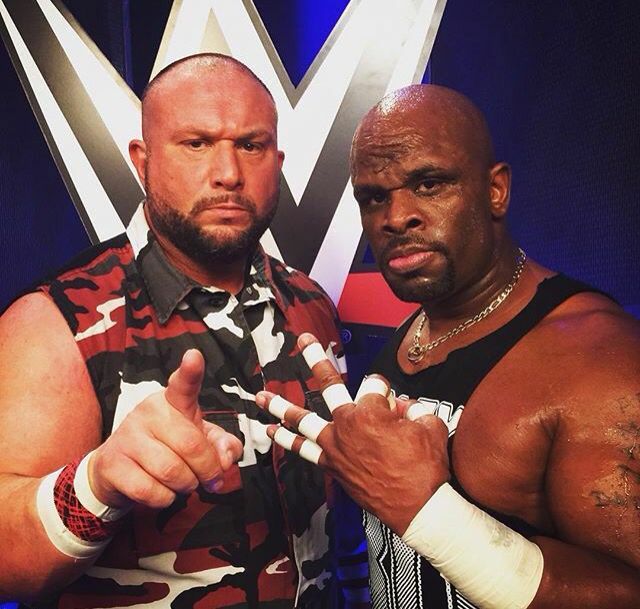 The Dudleys will always been synomous with the since defunct wrestling company. Twenty years since their debut, the Dudleys continue to make their mark on the business, without losing much as far as workrate in the ring. Bubba Ray (or Bully Ray) also showed his ability to tweak his character as a solo monster heel during his run with TNA. 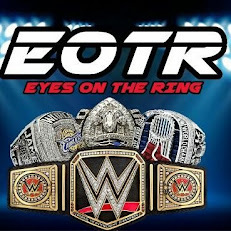 Although the team did return to the WWE this past year, the run lacked the success their previous run did. It was more of a nostalgia act, which I feel wasn't necessary. They could have had another run, helping younger teams along the way, but they basically just became a punching bag instead.Still, the Dudleys have been regarded as the greatest tag team in the history of the WWE, technically winning the title 10 times, if you want to count the WCW title victory under the WWE umbrella. 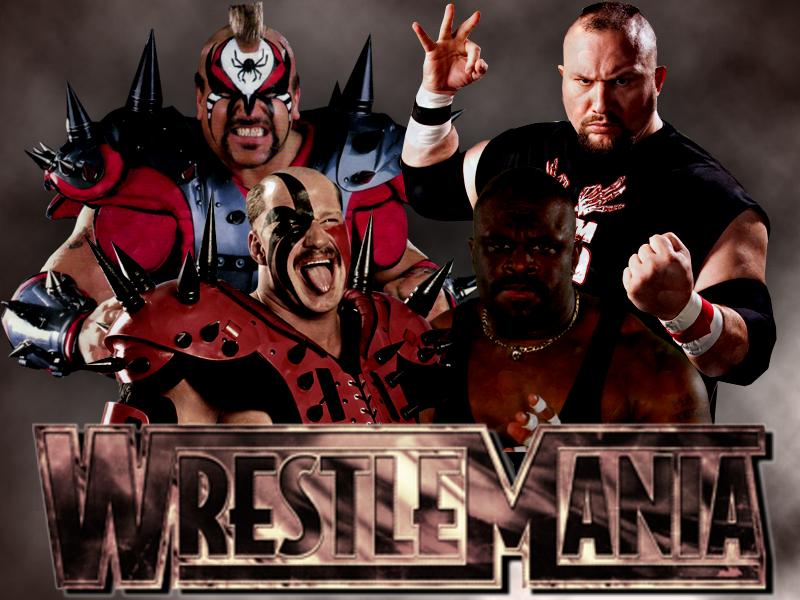 If I had to choose a team that would win a confrontation between the two teams I'd pick the Road Warriors. I'm basing that strictly on power and the outside interference of Paul Ellering. Ellering was the perfect compliment to the Road Warriors, cutting intelligent promos for a team that was known for it's unbridled aggression. The chemistry was perfect. Bubby Ray and Ellering in a promo war would have been fun to watch. Technically, that could still happen, since Ellering is currently in NXT and Dudley is still active on the wrestling scene, but obviously wouldn't have the same effect. The Doomsday Device versus the 3D, both devastating finishers. Again, I'd give the edge to the Road Warriors based solely on power. But if you add the table to the 3D, there's no question the Dudleys have the edge. While the idea of the scaffold match was far greater than the actual match, it could have been something to see the dream match happen in such a match. But we continue to dream!